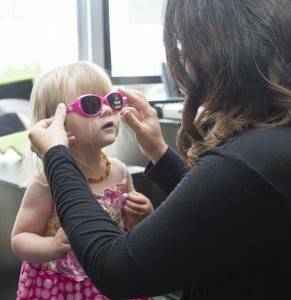 At Executive Park Eye Care we welcome patients of every age, from infants to the young at heart! Our team of vision professionals is happy to help diagnose and treat a myriad of vision issues and concerns for your entire family. Whether you need an eye exam, dry eye treatment, sports and specialty eye wear or LASIK surgery, we are your one stop vision center. It’s critical to have your child’s eyes examined. The recent video of 10 month old Piper seeing clearly through her first pair of glasses, highlights the importance of early vision exams. It goes to show you that many children with seemingly normal vision have problems that are only detected in a comprehensive eye exam. This type of exam is different from a vision screening done at a school or a pediatrician’s office. All children should have a comprehensive eye exam at a local optometry practice near Briargate, CO before they enter school. InfantSee providers like Dr. Gales also perform no-cost exams on children ages 6-12 months. To learn more about the InfantSee program and how your child can receive a free eye exam, visit www.infantsee.org or call today for an appointment. If, like Piper, parents notice a delay in certain developmental milestones you would see for a child; crawling, rolling over, things like that, it could be related to their vision and a pediatrician can identify those issues. And it may be connected to their vision but the only way to find out is to have it checked by an eye doctor.